Kimberly-Clark Professional™ has launched the new Scott® Control Toilet Tissue system to complete its Scott® Control washroom solution. Now available as a full range of products, the new system provides users with the highest standards of hygiene without compromising on efficiency - delivering an uncompromised clean, every single time. The new Scott® Control Toilet Tissue System has been specifically designed to help control usage in the washroom whilst providing the highest standards of hygiene. The centrefeed format brings controlled single sheet dispensing, helping to reduce usage of toilet tissue. It also reduces the likelihood of toilet blockages and waste paper on the floor, minimising additional maintenance and cost. 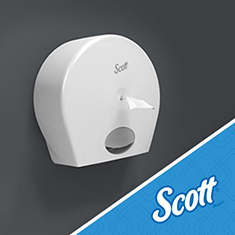 The Scott® Control washroom range also includes the Scott® Control Rolled Hand Towel System and the Scott® Control Foam Hand Cleanser System. The complete solution helps to fight against the spread of germs at every stage of the washroom. 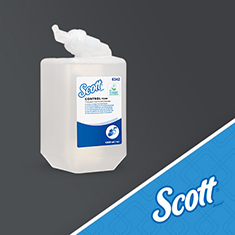 Scott® Control Toilet Tissue: Hygienic, fully enclosed, protected roll. Only touch the sheet you use. 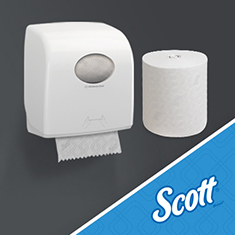 Scott® Control Rolled Hand Towel: Reduces cross-contamination with no dirt traps, one wipe clean Aquarius* dispenser. If you are interested in trialling the Scott® Control Washroom Range – to achieve leading hygiene and efficiency in the washroom - contact your local Service Centre. Click below for the downloadable factsheet on the complete Scott® Control Range.